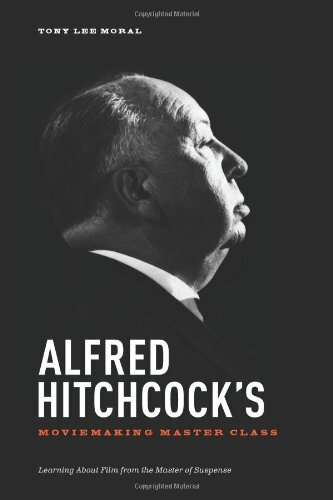 There have been countless books devoted to Alfred Hitchcock. Most are film theory, many are biographies, and others are detailed accounts of the making of a specific Hitchcock film. Nearly every theoretic angle has been covered in meticulous detail. However, Tony Lee Moral had something very different in mind for “Alfred Hitchcock’s Moviemaking Master Class.” This book is not intended for scholars. It does not delve into theory, biography, or detail any film’s creation. Moral prefers to offer future filmmakers a text for using the films of Alfred Hitchcock as a tool for learning the filmmaking process. It is really a superb idea. Could there be a better tool for teaching young filmmakers the craft of filmmaking? It is certainly difficult to think of one. The book covers the entire filmmaking process (writing, planning, shooting, editing, and marketing) using easy to understand anecdotes. Those already well versed in Alfred Hitchcock related knowledge will likely not learn anything new about the director, but future filmmakers now have a useful new resource for learning and understanding their craft. Tony Lee Moral is responsible for writing “Hitchcock and the Making of Marnie” and “The Making of Hitchcock’s The Birds.” Both of these books are valuable resources to the Hitchcock scholar (and to fans of the director). Moral brings his knowledge and research to practical use in “Alfred Hitchcock’s Moviemaking Master Class” giving the text a level of credibility that might have been lacking if another writer had written the book. This is required reading for anyone interested in making movies. First of all, I love the look of this theme for a Hitchcock blog. Very clever. Secondly, I really like the looks of this book. Sounds like a person could learn a lot from it. Thanks for the recommendation!